The Islamic State terrorist organization released a new audio message on Wednesday purporting to come from the mouth of the group's caliph Abu Bakr al-Baghdadi, who asserted that Islam is not the religion of peace, but rather the religion of violence. 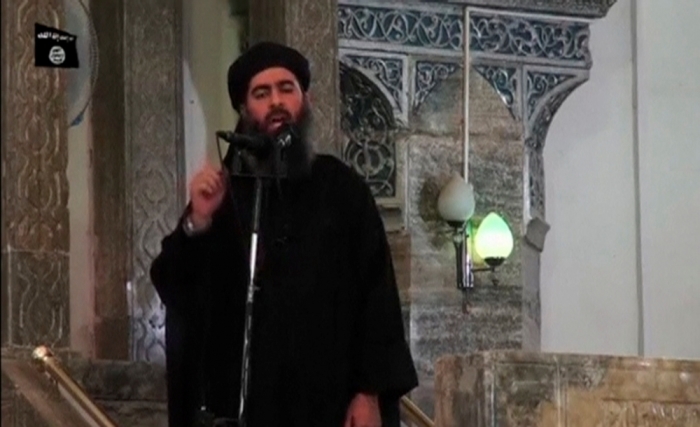 If it is in fact Baghdadi speaking in the message, which was posted by the group's al-Furqan media outlet and shared by several ISIS-affiliated websites, it would mark the first time that the public has heard from Baghdadi in months, after it was reported that he was immobilized by a spinal injury resulting from shrapnel wounds from an airstrike. The last audio message Baghdadi released was in November, which was just days after he was wounded in another airstrike. BBC reports that analysts believe that the voice in Wednesday's audio message, entitled "March Forth Whether Light or Heavy," sounds like Baghdadi's but it's still hard to verify. "The voice on the audio recording is clear, assured and, in places, almost melodic. If it is indeed, as is claimed, the voice of Abu Bakr al-Baghdadi, then it will put [end] to previous rumours of his death," BBC correspondent Frank Gardner said. In the message, Baghdadi encouraged all Muslims to to take up arms and fight in what he labeled "the war of all of Muslims." "Islam was never a religion of peace. Islam is the religion of fighting," Baghdadi stated. "No one should believe that the war that we are waging is the war of the Islamic State. It is the war of all Muslims, but the Islamic State is spearheading it. It is the war of Muslims against infidels." "O Muslims, go to war everywhere. It is the duty of every Muslim," the 43-year-old jihadi leader continued. Baghdadi's comments echoed the thesis of a Dabiq (ISIS' English-language magazine) article from February, which stated that "Allah has revealed Islam to be the religion of the sword." Although Baghdadi claims that his organization's jihad is "the war of Muslims against infidels," ISIS is not just killing Christians, Yazidis and other religious minorities. ISIS is also killing Muslims who don't agree with the group's brutality or refuse to pay allegiance to the caliphate. Baghdadi hinted at why it is ISIS kills Muslims in his message by stating that there are no rights for anyone except those in the caliphate. "There is no might nor honour nor safety nor rights for you except in the shade of the caliphate," he said. As the Saudi government has led an airstrike campaign against Shiite rebels in Yemen, Baghdadi criticized the Saudi government's actions and said its involvement will help lead to the kingdom's demise. The timing of Baghdadi's message comes one day after it was reported that ISIS' second-in-command leader, Abu Alaa al-Afari, who was recently named the acting head of ISIS while Baghdadi recovers, was killed by a coalition airstrike. With some debate as to whether or not Baghdadi is still alive, former CIA counter-terrorism expert, Buck Sexton, thinks Wednesday's audio message was simply to show the world that ISIS' leader is alive and that the coalition airstrikes did not kill both of ISIS' top two leaders. "This is obviously ISIS trying to say, 'Yeah, yeah, you thought you got him but you didn't. Keep dreaming,'" Sexton told CNN.